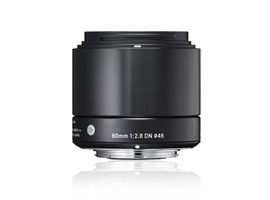 Sigma were the first to market with lenses designed specifically for mirrorless cameras, and uniquely, the DN series were made for both APS-C Sony NEX cameras and Olympus/Panasonic bodies with their even smaller MFT format sensors. As with full-frame models, the lenses have a different angle of view between the two different formats. The restyled A-category 60mm f/2.8 DN reviewed here is the equivalent to a 120mm on a MFT body but only a 90mm on NEX camera. Like the others in the DN series, the minimalist design and sheer physical size (in diameter at least) is also somewhat at odds with the rather conventional styling and compact dimensions of the Panasonic and Olympus cameras. Be that as it may, common to both mounts, the 60mm features a linear-AF motor for smooth and quiet focusing with a minimum focus distance of 0.5m and includes low dispersion glass and aspherical lens elements. The lens has a sticker price of a not unreasonable $239, regardless of mount. 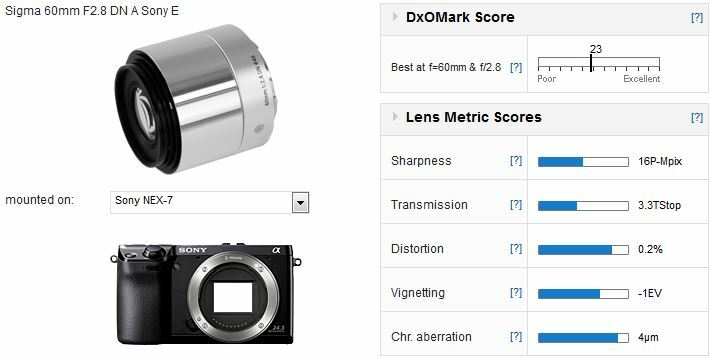 When mounted on a Sony NEX-7, the Sigma 60mm performs very well indeed, achieving a very respectable DxOMark Lens Score of 23. 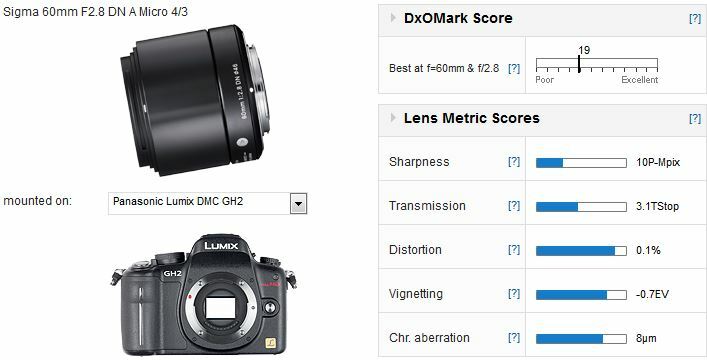 In fact, that’s the best result we’ve seen for a Sony E mount lens. The Sharpness score is high (at 16P-Mpix), due, not only the high levels but also to the uniformity across the field (measured at less than 7% variance across the frame). Distortion and vignetting are well within what’s expected with a lens like this (with a modest maximum aperture) and so to is chromatic aberration; in fact, it is very low. As with NEX mount iteration, the MFT version is very sharp and consistently so across the frame. Some slight differences can be noticed on the test bench though. Transmission isn’t quite so disparate from the maximum aperture as it was with the NEX lens, and vignetting is lower, though this is well controlled in both. Chromatic aberration is higher on the GH-2 but barely noticeable in real world images. Against the slightly shorter, faster $299 Sony E 50mm (75mm equivalent) f/1.8 the Sigma is noticeably sharper, and vignetting is low. In spite of the faster maximum aperture, however, the Sony has excellent control of Chromatic Aberration though and achieves a similar Image Quality rating overall. Given the faster aperture and OSS (stabilization feature), the Sony is a good choice even though it’s more expensive. For all that, the Sigma is excellent value. 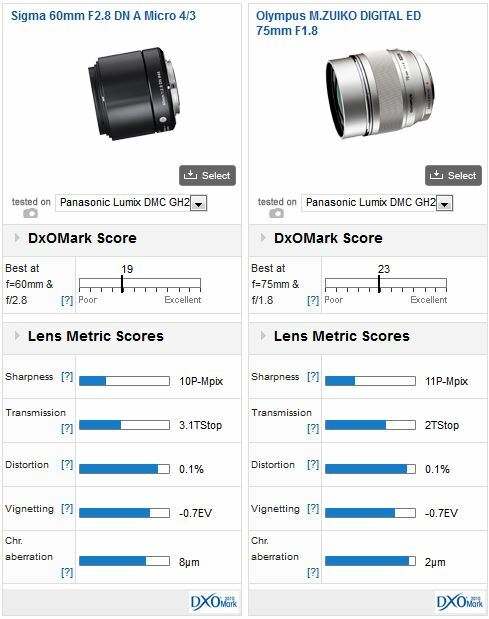 Comparing the Sigma MFT mount lens with the best performing telephoto prime available for the Olympus/Panasonic cameras we can see that the modest little 60mm is not to be ignored. Given the $700 price difference, the Sigma is outclassed in many ways and yet could still be a contender. Over the comparable aperture range (f/2.8- f/22), the Sigma isn’t far behind in sharpness levels and there are no real shortcomings elsewhere. Compared with the usual kit zooms, the Sigma 60mm f/2.8 may not be the most versatile of lenses but the 0.5m minimum focus distance is useful for occasional close-ups, and the linear AF motor is more suited to video than most. 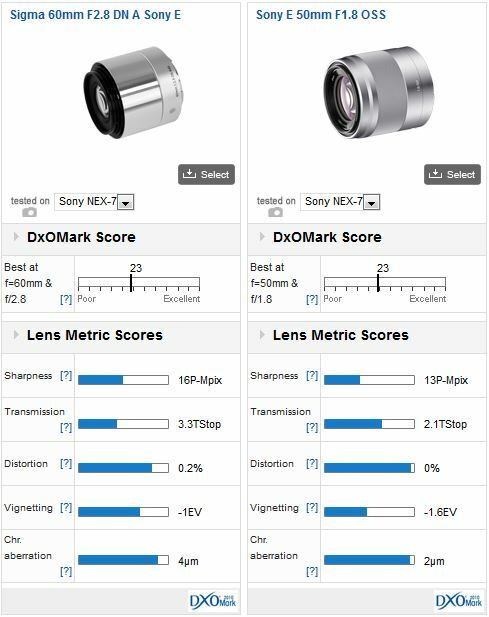 As for the optical quality, the 60mmputs in a solid a performance. And, at $239, it‘s not inaccessibly priced.